I got groovy in the kitchen while I was cooking dinner tonight (it's actually a regular occurence). For me there is nothing better than cranking up the tunes while cooking. If a good song comes on, I get really into it by taking a pause from cooking and dance my heart out. If my kids catch me when this is happening, they drop everything to join in. If you don't already dance while cooking, I highly recommend it! I also highly recommend making the outstanding dinner I made tonight. We had Orange Maple Glazed Salmon, Mixed Greens with Spicy Pecans and White French Dressing, Smashed New Potatoes, and Steamed Green Beans. 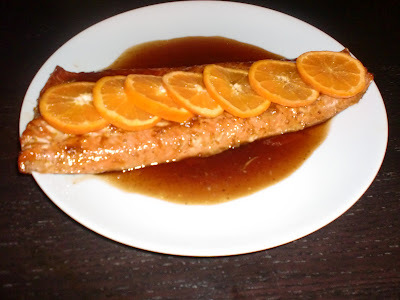 The orange maple glazed salmon was so easy to prepare, and the results were excellent. This would go well with any side dish. Eating salmon is a good way to get omega-3s (which help basically every function in your body). I bought tonight's salmon at Whole Foods, it was very fresh, and I believe this makes a world of difference. The spicy pecans from the salad recipe are highly addictive. Beware! The recipe makes extra, and you will be happy about that. They would also make a nice gift in pretty packaging. Don't worry this salmon is not too sweet. It's so good! 1/4 C. pure maple syrup, DO NOT SUBSTITUTE! 1 Salmon filet, 1-2 lbs. Place salmon in a large baking dish sprayed with non stick cooking spray. In a small bowl mix together the orange zest, orange juice, maple syrup, soy sauce, garlic, salt, and pepper. Pour over the salmon. Place in the refrigerator to marinate 30 minutes. Preheat oven to 400 degrees. Bake for 20 minutes or until salmon flakes easily with a fork, spoon pan juices back over salmon half way through. ﻿Arrange thinly sliced orange along the top for garnish. Toss all of the above ingredients in a large salad bowl. Serve immediately. Whip egg white with a whisk until it is foamy. Add the salt, sugar, worcestershire sauce, paprika, cayenne, and mix together. Toss the pecans in the egg white spice mixture until completely coated. Place pecans on a baking sheet covered in parchment paper in a single layer. Bake for 30 minutes, stirring every 10 minutes. Normally french dressing is ketchup based, but this particular one is not. Place all of the above ingredients into a measuring cup. Using an immersion blender, blend until emulsified. Makes more than enough for 1 salad, refrigerate any leftovers. Smashed Potatoes are not Mashed Potatoes. These are yummy! Place potatoes in a pot and cover with water. Place pot on stove and bring water to a boil, boil potatoes until they are tender. About 30 minutes, check by sticking a fork in the middle, if it slides in easily, then it is ready. Drain water and put potatoes back into the pot. Add the butter or margarine, letting the heat melt it. Using a fork, smash each potato. Sprinkle on the dill, green onion, salt and pepper to taste. Mix potatoes until all the ingredients are combined. Finally, to the steamed green beans. I literally steamed them, and then left them plain. Usually when I make a meal with a lot of different bold flavors, such as tonight, it is good to leave something plain, it is all about balance. My kids enjoy green beans like this, which makes me proud to see them eating green veggies. I hope you will try making some or all of this meal, and definitely hope you will give the dancing and cooking a shot. Let me know if you do, I would love your comments!